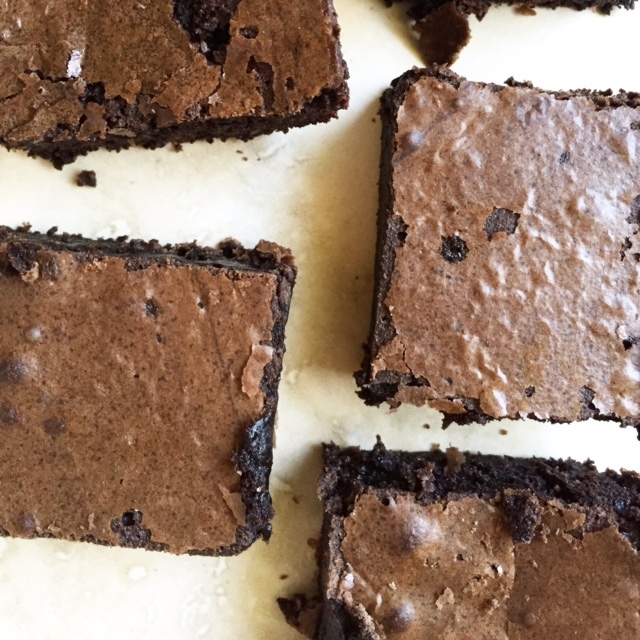 these might be the perfect brownie. if you aren’t into spicy things like i am or have little ones, you can omit the cayenne pepper. but instead of omitting it altogether, i have come up with a solution. i have 2 little girls who love chocolate mayyybe more than i do so i make it like this: i mix everything but the cayenne, pour half the batter into an 8×8 dish, then whisk in 1/4 tsp cayenne to the last half of the batter (mix well) and then pour it into the other baking dish. then you have one spicy/adult dish’o’brownies, and one for the kiddies. inexplicably, my little half-texans are not fans of spicy. yet. 1. preheat the oven to 325. grease a 9 x 13 (or two 8-inch square) baking dish generously with coconut oil or baking spray. 2. melt butter and chocolate together in a medium saucepan over medium-low heat, stirring until smooth. remove from heat and let cool for a few minutes. 3. while you’re waiting for the chocolate to cool, in a large bowl, combine eggs, vanilla, and sugar – whisk well. stir in remaining ingredients. add in melted chocolate and butter. stir to combine.